Despite years of deteriorating conditions in the skilled nursing facility (SNF) industry, Omega Healthcare Investors (OHI), the nation's largest SNF REIT, was able to increase its dividend for more than 20 consecutive quarters. However, due to rising tenant distress, for 2018 management announced a major turnaround effort and froze the firm's quarterly dividend at its current 66 cents per share. Let's take a look at how Omega's turnaround is going, recent government healthcare policy updates, and management's expectations for the future. This should help provide Omega's shareholders with greater clarity regarding the safety of the REIT's high dividend. At the start of the year, Omega announced that the bankruptcy of tenants such as Orianna (which leases 42 of its 923 facilities) and the distress of major partners like Signature (now Agemo Holdings) were forcing it to make major changes to its property portfolio. Specifically, the REIT would have to restructure some of its master lease agreements with its tenants (taking 11% to 25% rent cuts) and sell over $300 million worth of its weakest properties in order to use those proceeds to buy new ones leased to stronger tenants. In terms of the lease restructurings, Omega has had some challenges with the Orianna agreement, which fell through on July 25, 2018. Fortunately, management still believes that its original plan of finding new, healthier tenants for 23 of Orianna's former facilities and selling its 19 least profitable locations will allow Omega to recapture $32 million to $38 million of its former rent from that tenant. If those actions are successful, Orianna's bankruptcy would result in a net loss of about 3% of revenue. Meanwhile, the restructuring agreement with Agemo Holdings means that one of Omega's biggest tenants now has a more reasonable rental coverage (operating cash flow/rent) ratio of 1.3. For context, in the SNF industry a 1.3 coverage ratio is considered the lower limit of sustainable rental coverage. As for asset sales, in 2018 Omega has so far sold nearly 70 facilities for about $335 million. According to CEO Taylor Pickett, the REIT plans to sell 15 to 20 more facilities for roughly $90 million before it's done with its property portfolio endeavors. In other words, Omega is now about 80% complete with its property turnaround efforts. As a result, the REIT's portfolio-wide tenant rental coverage ratio is now at a more sustainable level of 1.33 with 75% of annual rent coming from reasonably healthy tenants with rental coverage ratios of 1.33 or higher. However, about 10% of Omega's rent is still from distressed tenants, 12% from properties held for sale, and 3% from new facilities currently being filled. Omega is investing the proceeds of those sales into new investments with cash yields of about 9% to 12%, which represents a nice spread above its cost of capital assuming tenants are able to meet their obligations over the full lease term. This means that while the REIT's cash flow is still declining due to asset sales, on a per property basis it's growing its funds available for distribution (FAD). FAD is similar to free cash flow for Omega and funds the dividend. Management revised its FAD per share guidance for full year 2018 up about 1% in the latest quarter to $2.71, which would indicate a 97% payout ratio for the full year. However, according to management, factoring out hopefully one-time restructuring charges, the firm's FAD payout ratio is expected to drop to 91% at the start of 2019. "We feel good about the future of the industry with improving demographics at the beginning of a multi-decade cycle and a considered and thoughtful new reimbursement model next October. With an improved portfolio of assets and the majority of our disposition behind us, we can start focusing on redeployment proceeds and growing the business again." Analysts currently expect Omega's FAD per share to grow about 4% in 2019. If the REIT can achieve that, and its relatively stronger tenant base can allow it to avoid future lease restructurings, then Omega's payout ratio could fall to 87% next year. That would improve the safety of the dividend and potentially set Omega up for a possible return to dividend growth in the future. However, there is really no visibility into the health of the company's other tenants, who continue dealing with a number of uncontrollable challenges. A major cause for the SNF industry's distress has been changes in government health policy imposed by the Centers for Medicare and Medicaid Services (CMS). Over the years this has led to shorter patient stays, lower reimbursement rates, and a decline in the occupancy rates at mostly Medicare and Medicaid funded SNF facilities. Meanwhile, over the past five years costs (including rising nursing wages) have been slightly outpacing revenue growth for SNF tenants. Given their razor-thin margins, this has put immense pressure on SNF operator profitability and is the reason so many are now in distress. Given that 88% of Omega's facilities get most of their revenue from Medicare/Medicaid, it's important for investors to remain up-to-date on recent CMS policy changes. This is not an easy income investment to own. In April 2018, CMS proposed to implement a new patient-driven payment model (PDPM) which would adjust how SNF operators are reimbursed for the care they provide. CMS's shift in models is now mostly complete, and Medicaid and Medicare reimbursement for fiscal year 2019 (starting October 2018) is expected to rise 1.8% and 2.4%, respectively. CMS believes that the aggregate impact will be an increase of $820 million in Medicare payments to SNFs over the next year, providing a much-needed lift in cash flow. Then, for 2020, reimbursement rates are expected to be neutral for the industry, while recent policy changes will allow for cost savings that should help Omega's tenants potentially improve their margins, or at least keep them from further deteriorating. That being said, management expects that the shift from traditional fee-for-service Medicare to Medicare Advantage (on average 17% lower reimbursement rates) will continue over the long term at a rate of about 1% of patients per year. However, thanks to undersupply in SNF capacity (new net bed supply has been shrinking for the past decade), Omega expects the overall health of the industry and its tenants to improve in the coming years. Omega recently unveiled its latest proprietary long-term model forecasting the average rental coverage ratio for its portfolio over the coming years. 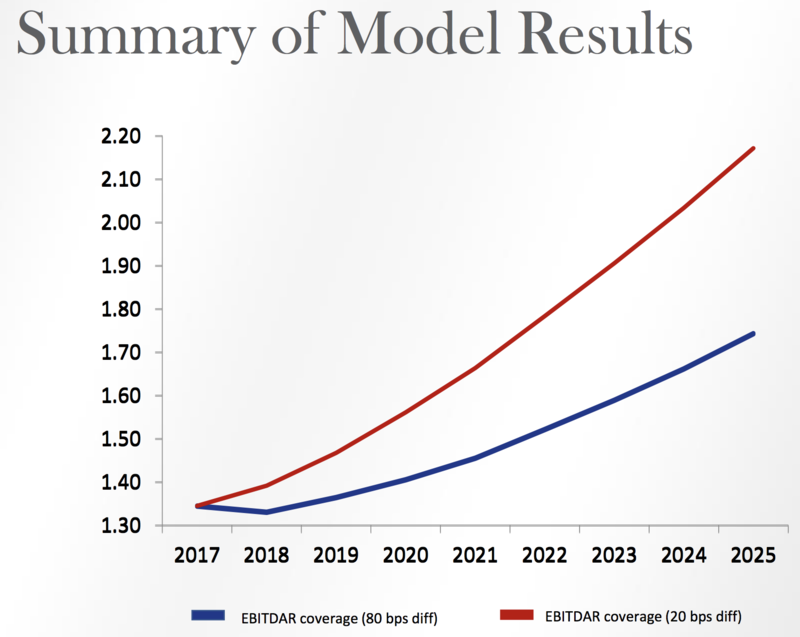 This model factors in negative shifts in CMS policy that are expected to continue. Key assumptions include gradually shorter stays, steadily falling reimbursement from the ongoing shift to Medicare Advantage, and zero potential cost savings are actually realized. It also factors in the strong demographic boost the industry is likely to see from America's aging population (most SNF occupants are 75+ years old). Rising operator costs are covered as well under two scenarios. The bullish case is that tenant operating costs will continue to outpace daily revenue growth (per bed) by 0.2% annually, which is in line with the five-year average. The bearish case assumes that 2017's 0.8% net cost increase will continue. Based on its model, Omega expects its overall tenant coverage ratio to bottom in 2018 at the latest and then start steadily increasing in the coming years. By 2025, the REIT expects its portfolio-wide rental coverage ratio to rise to a healthy 1.74 to 2.17, depending on actual operator cost inflation. And because the number of Americans aged 75+ (prime SNF users) is expected to nearly double from 20 million to 40 million between 2020 and 2040, Omega expects it will be able to grow at a solid clip in the longterm. That's partially due to its share price now rising to levels at which it can once more issue accretive equity to fund faster property and investment growth. That being said, Omega's CEO is still warning investors that the next 12 to 24 months will remain"challenging" due to rising labor costs potentially calling into questions even the REIT's worst-case assumptions. So while Omega's turnaround appears to be going well and the REIT has demographic trends in its favor, there remains a great deal of uncertainty and risk baked into Omega's dividend yield. While Omega remains a well-managed industry leader, the challenges facing the SNF industry and its tenants remain large, murky, and unlikely to drastically change in the coming years. Recent Medicare and Medicaid policy changes are likely to be less painful than in recent years, but negative trends such as a continued shift to lower reimbursement Medicare Advantage patient enrollments are likely to continue pressuring its tenants in the future. Meanwhile, the tightest job market in nearly two decades means that rising labor costs could offset much of the expected benefit from improving demographics which could greatly reduce the bullish thesis for the industry in general, and Omega in particular. So while management's upward guidance in terms of AFFO and FAD per share is certainly good news for nervous Omega investors, it's important to realize that the company remains the best house in a bad neighborhood that could still get worse. Omega is a high-risk stock that income investors will need to closely monitor each quarter to make sure that 2018 is an exception to its historically strong growth. Most importantly, investors will want to make sure that the REIT is able to return to cash flow growth in 2019 in order to lower its payout ratio and increase the safety of its generous dividend.